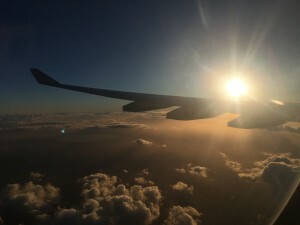 My arrival (following a few days of travel that are documented in this video) was a blur of paperwork, meetings, unpacking, and settling into the John Felice Rome Center. 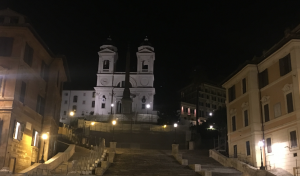 As work hard play hard is a generally good model of activity to follow (within reason, let’s not get too crazy here), the busywork of the first day in Rome was followed by an evening getting lost in its cobblestone streets. Very, very lost. Myself and a group of new and old friends had managed to understand Rome’s public transit system well enough to make it to the downtown area, but couldn’t quite find our way once we left the bus. We had a goal of seeing the Trevi Fountain, which we did later on in the evening, but ended up getting lost trying to navigate the winding streets that are so unlike the grids of Chicago and other major U.S. cities. We wandered for a couple of hours, casually stumbling upon the Pantheon and the Spanish Steps along the way, before we found our bus stop and headed home. Truthfully, in all the mess of discerning our proper path, there were some moments of stress and frustration, as is often the case when no one quite knows where to go but still has an opinion on which way is best. I took those moments as chances to be alone with my thoughts and reflect on the situation. What Rome has to offer is unlike anywhere else – even places that try to emulate it. It is a city of beautiful contradictions between ancient and fresh and traditional and modern. It has been a catalyst for so much in the rest of the world, managing to find its unique niche in the past, present, and future. I am eternally grateful to be present as a part of life here in the Eternal City, and I’m excited to share the rest of my adventures in my upcoming posts. Stay tuned to read my next post about our orientation trips to some famous Roman sites, a papal palace, and coastal Italy. If you can’t wait, check out this video to preview some of what I’ll be discussing. Ciao for now!